What the Clackamas Cavaliers need at this stage of the high school boys' soccer season is to play with a little more fire -- or what new head coach Thomas Kean calls "true desire." The Cavaliers showed their fiery side in spurts during Tuesday's non-conference game at Canby, but also struggled in key stretches in the second half as they dropped a 3-1 decision to the previously winless Cougars. Clackamas' Tyler Bennett scored on a partial breakaway in the 20th minute to give the Cavaliers a 1-0 lead, and then Canby answered with second-half goals by Kristopher Lopez, Alejandro Romero, and Francisco Cabello that helped send the Cavaliers (1-3-1) to a second consecutive loss. Time for Clackamas to worry? It's still too early in the season for that, but if the Cavaliers don't pick it up soon, Kean's first season as head coach could turn into a long season. Some teams often struggle as they transition to a new coach with a new philosophy and a new system, and that may be contributing to some of Clackamas' early-season woes. But Kean spent two seasons as the Cavaliers' JV coach before he was named in January to replace Brian Buttler, so he knew what it was he was getting into and where he envisioned the Clackamas program going when he took it over. He had good help, too, in lead assistants Juan Mayoral and Ian Tarkovsky, and they're working with players who are committed to playing soccer on a year-round basis, many with connections to the Eastside Timbers program. "We inherited a really well-oiled machine behind the scenes with a little bit of an old-school vibe in terms of what was being produced on the field.," Kean said. "With the newer-type of player we have and with the club scene improving so much in Happy Valley, we're trying to get a little closer to that brand of soccer. "That's sort of the main emphasis this season is: Can we move to a style that's more closely resembles what these guys play the rest of the year? Kean said the style he wants Clackamas to embrace is a significant departure from the style Buttler endorsed the past few years, but it's not anything that comes off as foreign to any of these players. "Brian knows high school soccer really well and was a guy who wanted to make sure we played to that sort of a standard, whereas I subscribe more to the theory of, 'Be the change that you want to see,'" Kean said. "I don't really like watching high school soccer, so we want to be the team that is part of the movement toward a more modern style." By "modern style," he means ball on the ground, passing out from the back, and trying to dominate through positional play rather than playing the percentages with long balls into the channels. "With the players we have, every single one of them plays club all year round, so to me it's a waste of their time and mine to try and enforce a completely different philosophy on them within two months and have them be successful at it," Kean said. "So, that's kind of the thinking there. Can we make the transition from club to high school a lot smoother and, hopefully, with the short season, hit the ground running?" Sounds reasonable, but then Cavaliers opened the season with a 4-1 loss at Forest Grove, followed by a 1-1 tie at home against Tigard, a 1-0 win on the road against Sherwood, and a 2-1 loss at home to Beaverton. Then there was Tuesday's game at Canby. Clackamas came out well-organized with junior goalkeeper Hunter Johnson, defenders Colm Dady, Andres Huizar, Kai Nelson, and Brandon Nguyen building from the back and up. Midfielders Brandon Farfan, Cameron Gaines, and Tyler Nguyen picked up where the defense left off, while Bennett, Keanu Cano, and Zachary Wilson led the attack up front. The Cavaliers scored first when Gaines, the sophomore midfielder and former Timbers Academy prospect, passed ahead to a streaking Bennett, who broke in one-on-one with Canby keeper Noe Rodriguez and made no mistake on his shot from inside the 18-yard with 20:40 to play in the half. Clackamas threatened three more times in the first half, but came away empty when Wilson put a header over the crossbar in the 31st minute, Wilson sent a bicycle kick off a Cano cross straight into Rodriguez's chest in the 35th minute, and Bennett drove a shot off the top of the crossbar in the 40th minute. 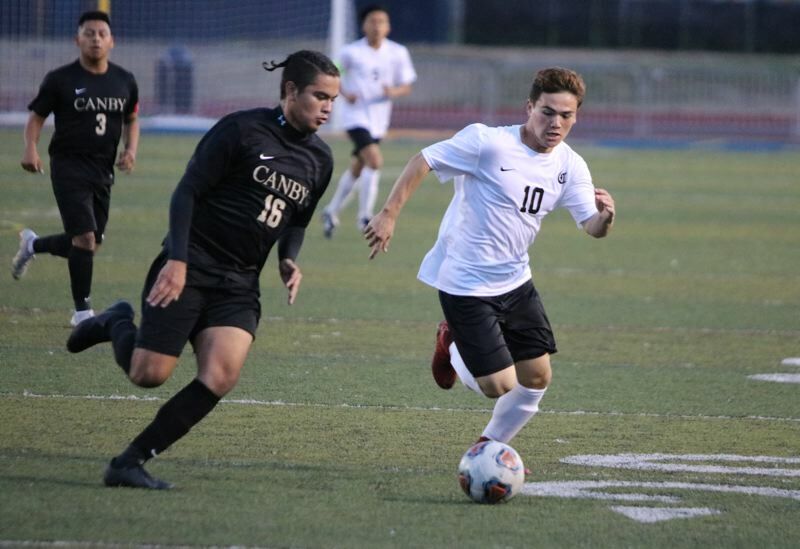 Canby, staring at a possible 0-5-1 start to its season, came to life in the second half, getting goals from Lopez in the 45th minute, Romero in the 51st minute, and Cabello in the 67th minute. Clackamas had four corner kicks, but couldn't get anything past Rodriguez, who stopped Cooper Sheakley's header in the 72nd minute, Tyler Nguyen's header in the 74th minute, and a shot by Dady in the 77th minute. "It's getting really tiring being told by opposition managers that we're 'a really nice team,'" Kean said. "It's worthless if all of the skill that they work on all year is not matched with any true desire and effort. "I don't mean 'effort' in terms of running, and I don't mean 'effort' in terms of work. I mean if every single 50-50 becomes a 70-30 in the opposition's favor, it doesn't matter how well you pass the ball in the midfield, you're going to get hurt in both boxes -- your own defensively, and the opposition's on the attack. "So I don't want to call into question the work rate and the distance covered and those sorts of things. But it's the true desire that is lacking in this young group right now." Kean sees a team that is playing at one of two extremes -- calmly on the ball as it moves from defense to offense or "just smashing it forward 100 miles an hour" when it nears the 18-yard box. "There's a spot right there in the middle that we're not finding and that's what it's all about -- it's enough fire to have that desire, but also enough of a cool head to still play your game," Kean said. "The way that we play in patches is what we want them to be doing. So, in terms of a look at the season as a whole, there has been enough in these five games to have faith. "There were two periods in this game, one in each half, where we were getting the ball down and moving it around and creating chances and opening them up. We didn't have the ruthlessness to take them, got a little lazy, a little sloppy, and that's the stuff that frightens me for the season." The Cavaliers are scheduled to close out the non-conference schedule Tuesday at home against Lake Oswego and then open Mt. Hood Conference play Thursday at home against David Douglas. "Our record could be better," senior co-captain Brandon Nguyen said. "We definitely should have won more games than we've lost. All the games we've lost have been because of our own mistakes, not teams outplaying us. But the thing is, that's our mental state, that's just us, and I think we can do better, way better. "Each one of us is talented, but the thing is we haven't seemed to connect with one another yet. We have only two seniors and most of these kids are from different clubs, different teams, and we're really not used to playing together yet. But I feel we'll get there over time. It's still preseason."